The first time I made preserved lemons was in the tiny kitchen of our second Tokyo apartment. In the end, we lived in three separate apartments during our 4 years in Japan. I had a particular fondness of the kitchen in the second apartment because in the afternoon and early evening sunlight poured through the windows. There is something about the time between 3 and 7 that I just love. The light is simultaneously soft and bright, bringing a little something special to what can sometimes be the hardest time of day. I may not have had any counter space to speak of, but at least I had light. Fair trade, if you ask me. As I packed lemon wedges into a jar during this maiden voyage to the land of preserved lemons, I remember wondering what on earth I would do with them when the salt had sufficiently infused the rinds, making them soft and salty. Somehow, I managed to use most of them in meals for one because Brad didn't care for them. I also found that I enjoyed them in homemade hummus, which helped to use up a few at a time. But this preserved lemon relish, which I only discovered a short time ago, is the ideal way to utilize this unique Moroccan ingredient. And I should mention that Brad loved this relish! Thank goodness. 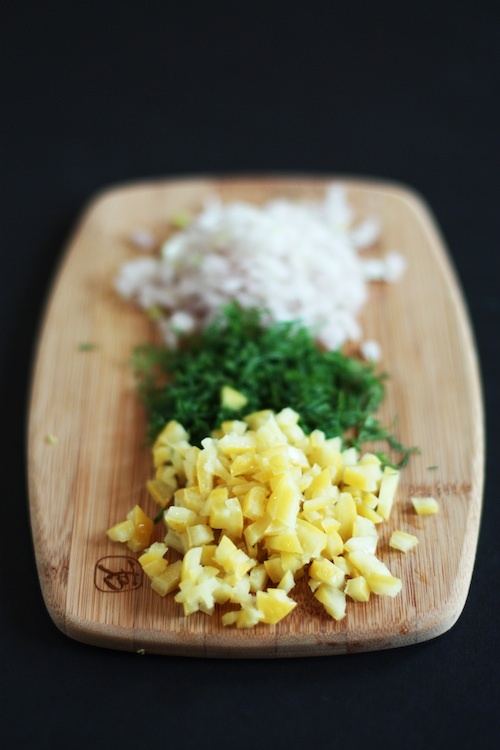 The briny flavor from the lemons is off-set by the fresh, sweet flavor of dill and the gentle bite of shallots. A generous amount of black pepper is added along with a healthy drizzle of olive oil. Stir it all together and you have something magnificent. 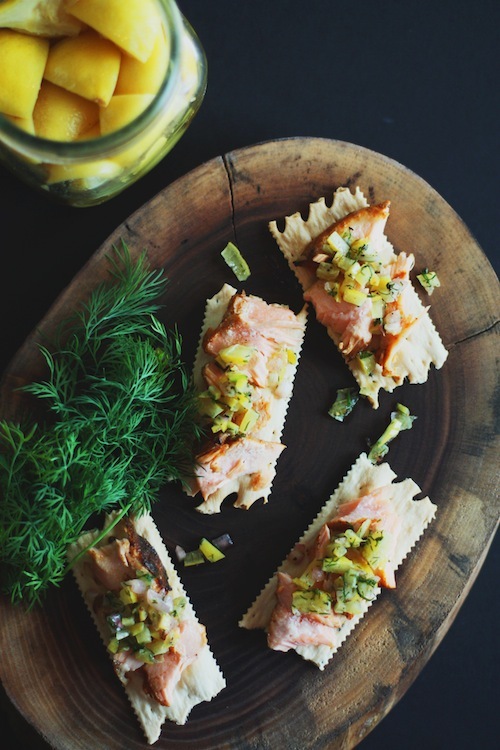 Spoon it on top of freshly roasted salmon, then use it the next day as an appetizer by topping a cracker with your remaining salmon and a dollop of the relish. You could even use the relish as a topping for hummus. The relish is wonderful after sitting in the refrigerator overnight as the flavors have the opportunity to cuddle up with each other and really meld. But it is perfectly wonderful served moments after stirring everything together. If you don't want to make your own preserved lemons, you can buy them at specialty stores or online. But if you have the time, I recommend making your own at least once. It isn't complicated and the results are fantastic. Combine all of the ingredients in a bowl and stir. That is all. I've read many recipes for preserved lemons and have taken all I learned from them to make this recipe. It's easy and has never turned out badly for me! Begin by sterilizing your jar and washing the lemons well. Cut the lemons in wedges by cutting them along the equator first, then cut each half in half again. Continue until you have 12 wedges from each lemon. Keep them in a large bowl at your work station. Next, put 2 tablespoons of salt, a few peppercorns, and 1 bay leave in the bottom of the jar. Place a layer of lemon wedges on top of the salt. Now, put another 2 tablespoons of salt over the lemons, along with a few peppercorns but no bay leaf. 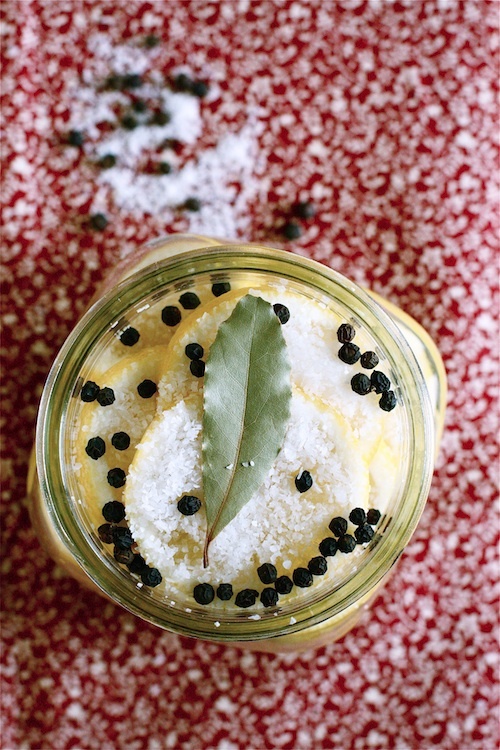 Continue with another layer of lemons, then salt and peppercorns until the jar is filled. For the last layer, top the salt and peppercorns with another bay leaf. Make sure to press down firmly on the lemons after each layer to release some of their juices. When you finish, the lemons should be covered in liquid. If they aren't, you can add a touch of water. Put the lid on your jar and place it in the refrigerator where it will stay for the next 2-3 weeks or until the rinds have softened. For the first few days, turn the jar upside down and right side up to evenly distribute the salt and juices.